Of course, humans are animals, too, but the other creatures with whom we share our world deserve their own special acknowledgement. I honor them all here with paintings and sculpture. The bird in "Dazed" hit the window of the visitor center at an eagle breeding preserve in the Scottish Highlands and needed to rest a while to recover. He/she was checked for injury by a rehabilitation specialist and would be okay soon. I don't know what kind of bird this is. Any ideas? "In the Garden" Oil 5"x 7"
The insect on the daisy in "In the Garden" is actually a type of fly, not a bee. Many flies are colored like bees, but the absence of a pollen basket on any of their legs reveals that they are flies, not bees. This fly was busy in the garden of a home at Kirkibost, North Uist, Outer Hebrides. "Zuni -- Inside Looking Out" Watercolor 7" x 8 3/4"
The subject of "Zuni -- Inside Looking Out" is the contrast between the cool, shadowy interior of a kitchen and the bright light of midday outdoors. Obviously, Zuni would rather be out enjoying nature than stuck inside on a day such as this. 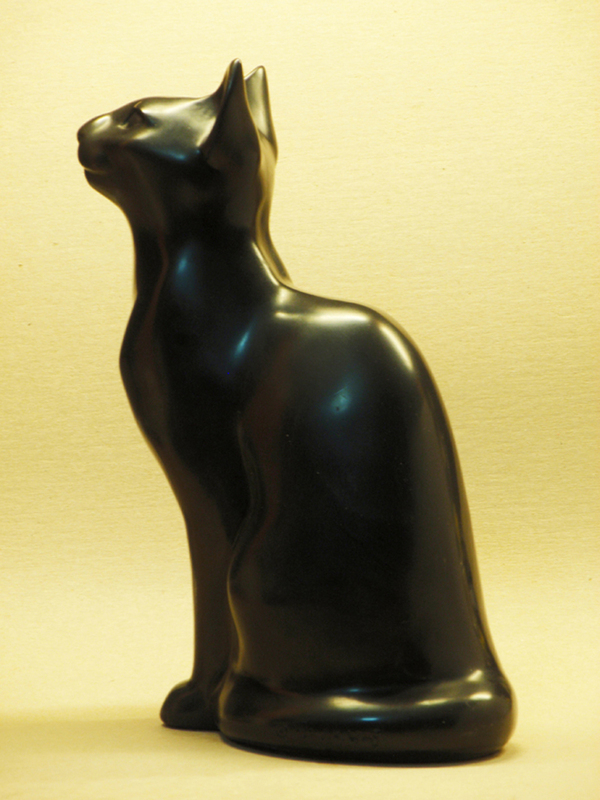 "Pie One" view 1 Dyed "cast marble" 11 1/2" x 7" x 4 1/2"
"Pie One" view 2 Dyed "cast marble" 11 1/2" x 7 " x 4 1/2"
"Pie One" is a portrait of a black and white cat, but of course, the sculpture does not concern itself with color. Note her idiosyncratic features: she wraps the end of her tail around herself behind, not in front of, her front legs, and she has a convex nose. "Moxie" Oil 12" x 16"
"Moxie" was the last cat I shared my home with. We had a very special relationship, which became even stronger after she became very ill. I have not had the heart to adopt another pet since, and I expect I never will. 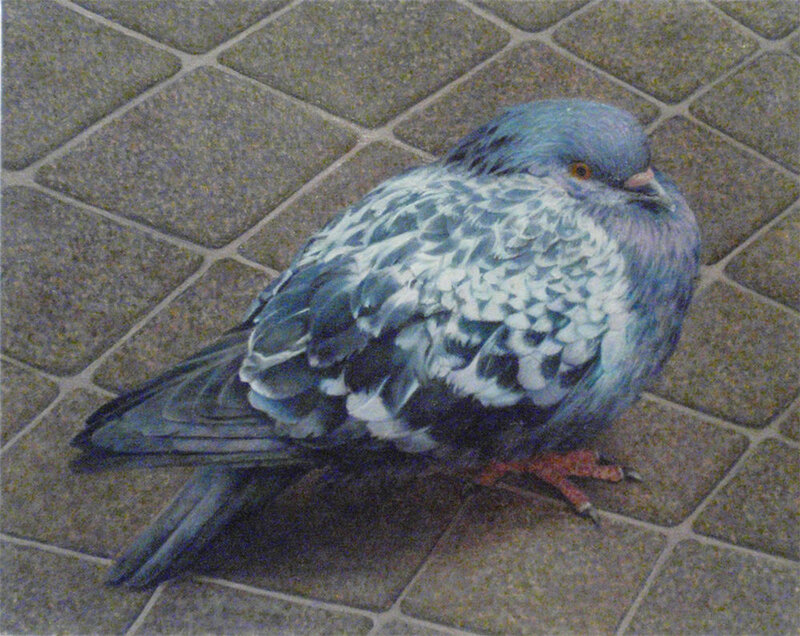 "Glasgow Pigeon" Oil 8" x 10"
"Trooper" was a very challenging picture to paint due to the enlarged size, which is many times larger than life. Excruciatingly exacting detail was essential in order to execute a realistic painting many times larger than life-size. Trooper is a piebald Clydesdale-Thoroughbred mix. "Sam -- The Old Gentleman" Oil 12"x 16" Reproduction also available. 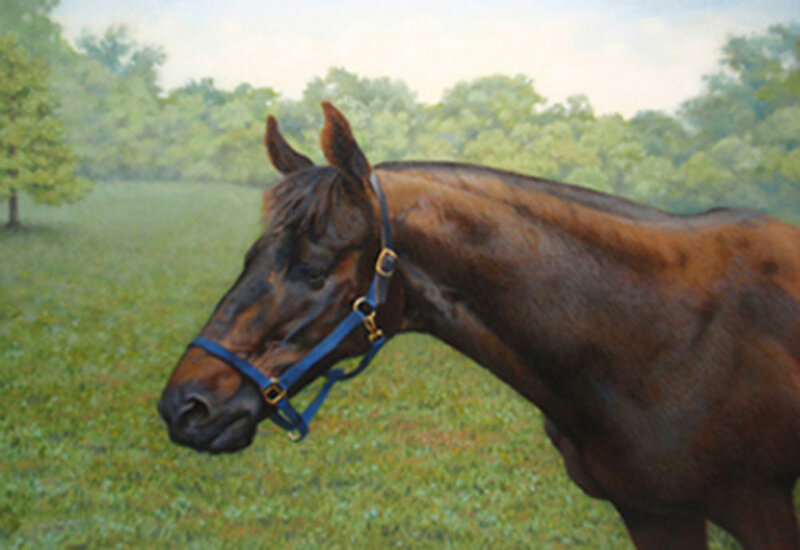 "Sam" was a thoroughbred and was rather "elderly" as horses go, but excellent care made him more handsome as an old horse than he was as a young one. I called him "the equine Fred Astaire". Mares seemed to swoon whenever Sam walked past, and he also had a special girlfriend, in spite of the fact that he was a gelding. 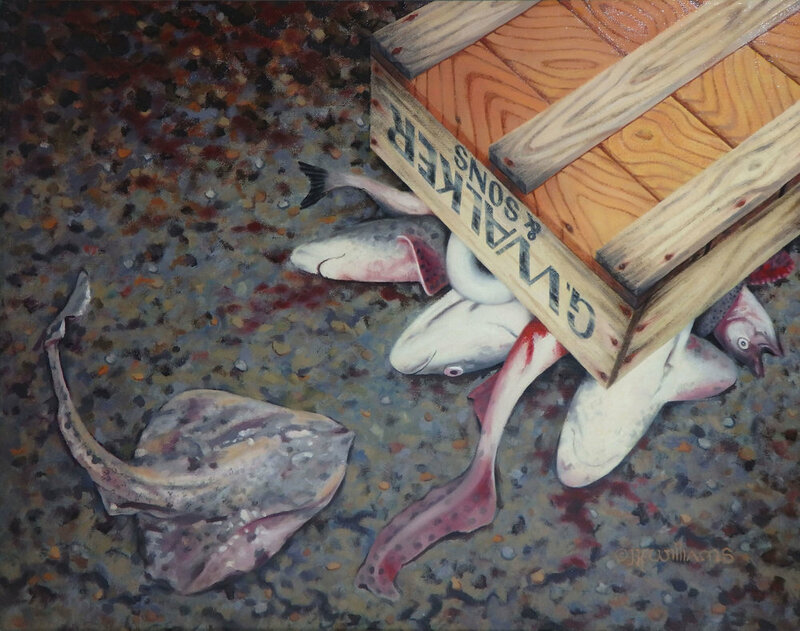 "Sidewalk Sweetie" Oil 11 1/2" x 15 5/8"
"Garbage Fish" Oil 12" x 16"
I call this piece "Garbage Fish" because this is how fishermen refer to net-caught fish that have no market value. I wouldn't call any creature "garbage". This painting was inspired by a scene I photographed in Portree, Scotland. 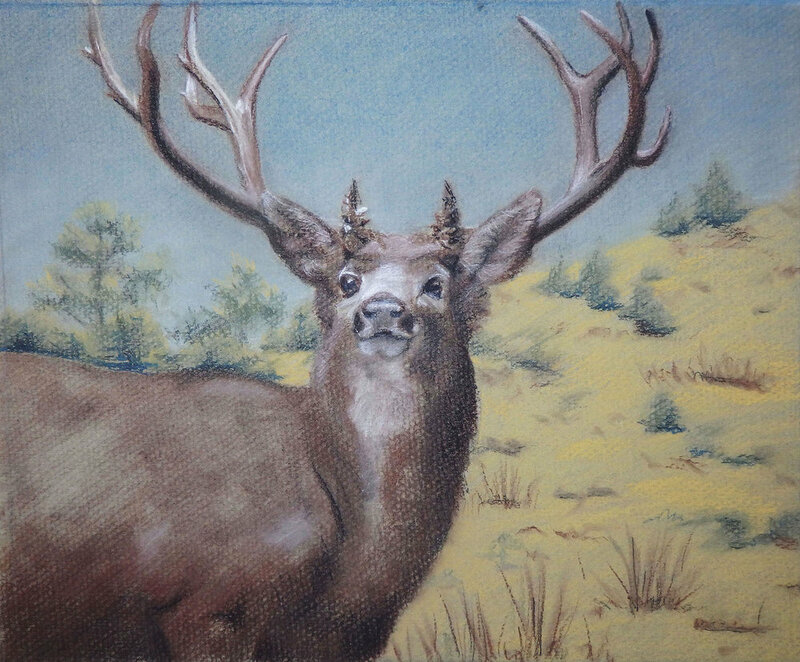 "Mule Deer" Charcoal & conté on paper 8 1/4" x 10"
This "Mule deer was actually a taxidermied "specimen" at the American Museum of Natural History in New York City. "In the Rockies" Charcoal and conté on paper 10"x 7"
This bighorn ram in "In the Rockies" was drawn from a taxidermied specimen at the American Museum of Natural History in New York City. I've seen this beautiful creature in the wild, where they are vastly more beautiful than they are in any zoo or museum. "The Sweetest Nap" Graphite 7 1/4" x 12"
While both individuals in "The Sweetest Nap" are obviously relaxed, Fitzgerald (the cat) seems to be in a state close to bliss. All rights to text and image content reserved by the artist.